Being the Jane Ray fan that I am, I admit to being completely biased in my review. I could stare at the illustrations all day. 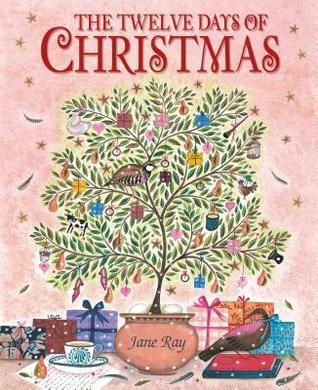 This book is quite simply the lyrics of the song Twelve Days of Christmas but is paired with some beautiful art work. The colors are bright and cheerful and their is the usual whimsy to Ray's work. I enjoy having many of my favorite Christmas songs in picture book form and this was a welcome addition to my collection. Well, besides my less than desirable version as I sang this book to my children who could go wrong with the The Twelve Days of Christmas? Grades K-6 Even if you have other versions of the carol, this is a worthy one to add to your collection. Jane Ray's illustrations bring the folk song to life beautifully and with a quiet humor. Along a busy row of townhouses, a woman receives her gifts from a secret admirer each day. The various feathered and fowled gifts in the first half of the song are nicely done, but it' the later gifts that readers will want to pore over. The nine ladies dancing are a flapperesque bunch that seem to be doing the Charleston as they float by the townhouse on a boat. The eleven pipers piping and twelve drummers drumming are a multiethnic mix who are tooting and beating on a variety of instruments from around the world. Sharp-eyed readers will know ahead of time who it is that knocks on the door at the song's conclusion to present himself as her true love. Just like her earlier books, this is a delight. This was such a fun book to read! It was a combination of a song book of The Twelve Days of Christmas with detailed, beautifully drawn, repetitive illustrations that felt a bit like "Where's Waldo" with much to examine and appreciate. By the end of the book, each apartment introduced on the first day of Christmas had received the allocated gift for the day (with opportunities for readers to match the locations while counting and identifying cleverly drawn objects). The more you look at it, the more you see! I'd suggest singing along to the text, too! I like the idea of students being able to relate to the twelve days before Christmas as counting down for a math lesson and it actually happening. The students would have daily activities that they can create their art and math to decorate the classroom, as well as for "Secret Santa" gifts and other activities. The text/lyrics are traditional but the illustrations are Jane Ray's and they are lovely. Lovely traditional Christmas story - but I wasn't that into the illustrations. An elegant and lavish interpretation of the classic holiday song. This book is great getting close to the winter break. Have the students countdown starting with twelve days to the break and subtracting each day until then. I love how the "true love" is hiding in nearly every page. And how he is not white. Delightful illustrations! I loved the attention to detail and that she used all different kinds of people to populate the book. Great illustrations accompany the classic song. But "reading" this song made me wonder why in the world this song is so popular? Jane Ray - Born in London, Jane studied art and design at Middlesex University. Her main study was ceramics and she didn't start to illustrate until she left college. Her first published work was a series of greetings cards for Roger la Borde, followed by some book jackets, and eventually black and white illustrations for a poetry anthology with Orchard Books.